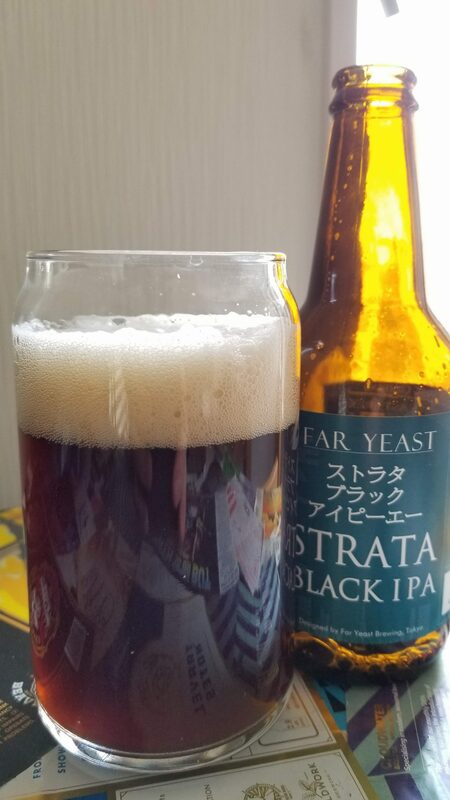 Far Yeast Strata Black IPA is a 5% black IPA from Far Yeast Brewing Company, based in Yamanashi, Japan. It’s part of their limited edition lineup and follows up the Far Yeast Strata IPA that was released at the same time. Like the Far Yeast Strata IPA, this beer uses imported Strata hops from the USA – the same hops that were used by Sierra Nevada as a finishing hop. It was first released for the Autumn Keyaki Festival event but is still on sale. Far Yeast Strata Black IPA poured out a dark brownish black colour with a plump white head on top, that had some hints of tan to it. It had slight acrid black malt nose to it. It did have the hoppy aroma I was expecting from a black IPA, with some citrus lemon aromas, along with some orange tones, stopped it from being too potent. The black malts offset the bitterness from the hops nicely, with Far Yeast Strata Black IPA having a roasted lemon kick to it, before some chocolate tones came through. I have to admit, the chocolate notes were a little peculiar for me. However, the straggly rough hoppy nature of the beer put me off a little – perhaps a softer profile would have suited the Strata hops rather than a prickly black IPA like Far Yeast Strata Black IPA. It finished off with some rough black malt edge merged with a lingering citrus hop flavour. Far Yeast Strata Black IPA is a little rough around the edges but the hops save Far Yeast Strata Black IPA – just.